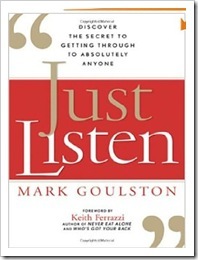 A colleague recently recommended the book “Just Listen” by Author Mark Goulston. Since I am a firm believer that we must keep improving our communication skills, I purchased the book. 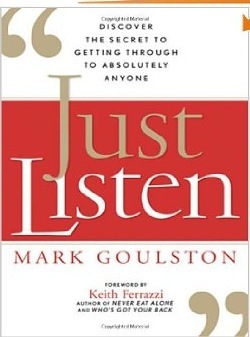 If you want to be able to develop the skills that are needed for others to listen to you, then this book is one that you will want to read. The book not only takes you through the steps on how to get others to listen to you, but in the process you become a better listener too. Take a look at the reviews and see if this is a book that you might want to add to your library. This entry was posted on Monday, September 14th, 2015 at 8:00 am by Tina Del Buono, PMAC. Filed under Communication, Leadership, Manager Topics, Self-improvement. You can follow any responses to this entry through the RSS 2.0 feed. Both comments and pings are currently closed.